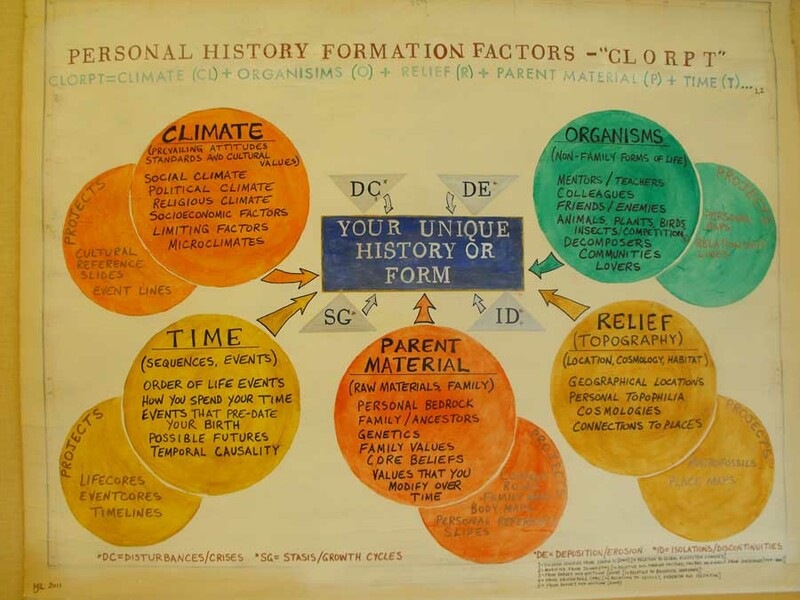 A modified version of Hans Jenny’s soil science “Clorpt” equation (a soil property is a function of Climate + Organisms + Relief (topography) + Parent Material + Time) is used to examine the forces that interplay to create a person’s history. In this model: Climate examines the sociopolitical climate surrounding an individual; Organisms delves into the influence of non-family persons and other biological organisms that influence a person’s life; Relief (topography) explores personal connection to places, or “topophilia”; Parent Material examines the values and histories of an individual’s family; and Time investigates personal use of time and the chronology of a person’s life. LifeCores are an excellent way to explore the variable of “Time” in this context. NOTE: Some items are still under construction. More images and creative projects will be added as this project progresses. To explore this model by variable click on the area of the diagram you want to explore.